Observe a beautiful demonstration of heat convection. 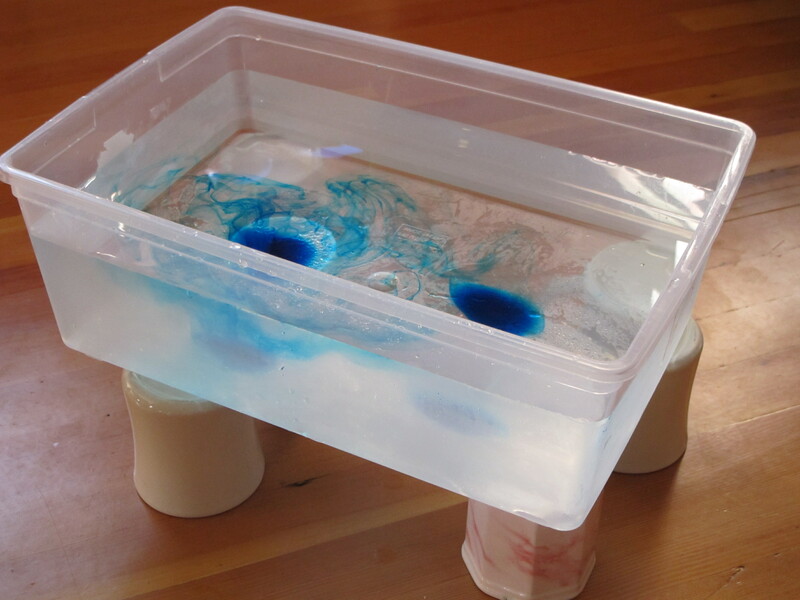 Can also be used to demonstrate the convection currents in the Sun. Stand a desk or table in an open area of the classroom. Arrange the four cans on the desk so that they can support the tub at each corner. Fill the large tub with cold water and stand it on the four cans so that it is stable. (Optional: add a few ice cubes to cool the water for 5 minutes or so, then remove them again.) Wait for the water to become completely still before proceeding. Boil the kettle of water, so that it is quick to boil again. Ask all the students to sit in a circle around the tub, so that they can see through the sides of the tub. Bring the kettle to the boil again, then immediately fill the styrofoam cup with boiled water. Slide the cup under the tub, and leave it directly below the pool of food dye. After a minute, streams of food dye should start to flow upwards from the food dye (see last photo above). Make sure all the students are able to see the food dye streaming upwards before continuing discussion. You may need to carefully wipe condensation from the outside of the tub for a clearer view. 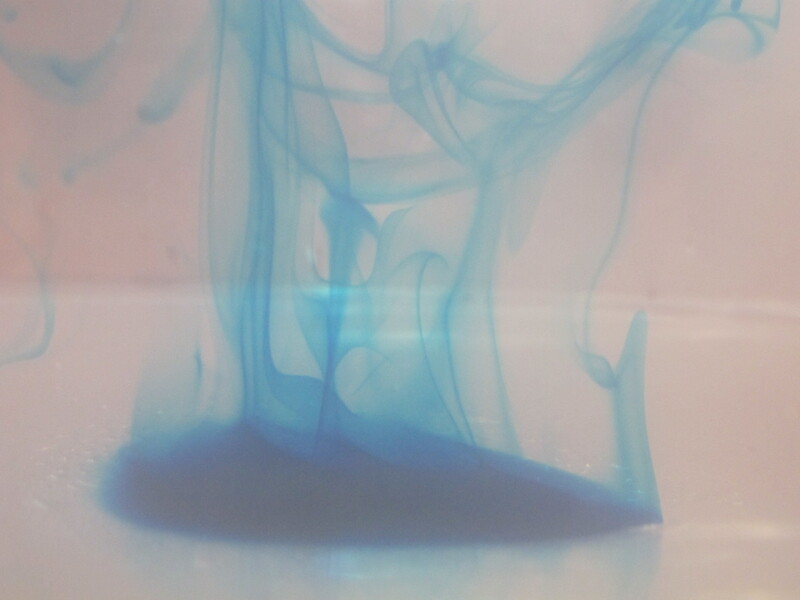 The hot water in the styrofoam cup heats up the water and food dye directly above it, making the molecules here move faster as they gain heat energy. This group of fast moving molecules flow upwards in the water (because they are less dense than the surrounding cooler water). They take heat energy with them, and are moving by "convection". 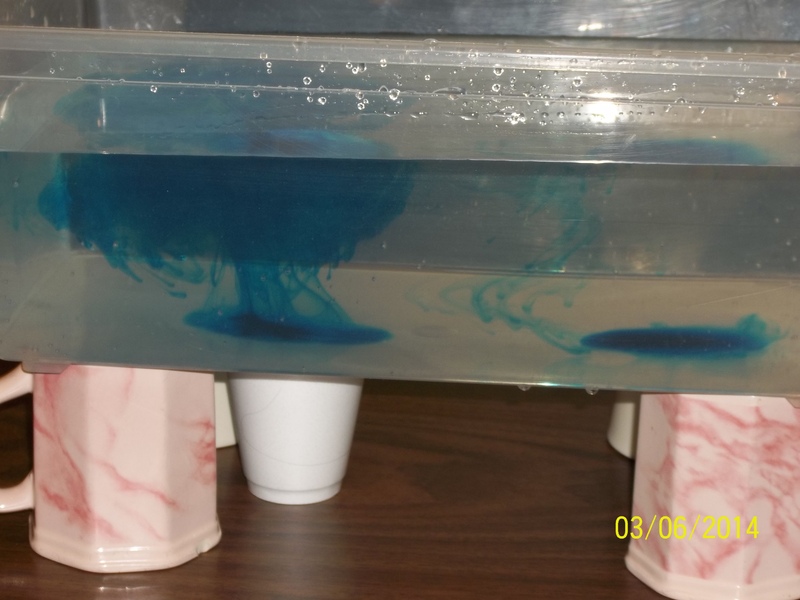 The visualized convection currents are beautiful as they trace out the curving patterns of heated water. Convection is the movement of a group of higher-energy molecules through a liquid, or a gas. Convection is how heat moves around the air in the classroom. For a lesson on the Sun, this demonstrates the convection currents that carry hot gas from the centre to the surface of the sun. 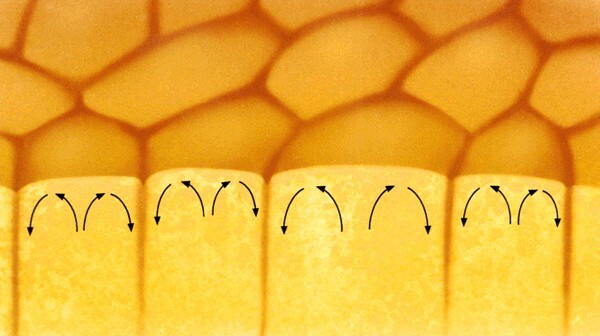 Many, separate convection cells, form the granulation patterns on the surface of the sun. Alternative set up: add an ice cube to the top of water. Drop food colouring on top of the ice cube. ?But then we see cold water sink, rather than warm water rise? Coloured tablets (e.g. to put in the bath) do not dissolve fast enough to work.